Sangbreeta’s presence as a speaker is built on her immense public speaking expertise and her sharp insight into how individuals and organizations can transform their presence, legacy and impact through powerful customer connection, communication and branding. With multiple international awards and Fortune 500 companies as her trusted clients, Sangbreeta is a thought-leader with the rare ability to both inspire audiences and leave them with actionable change strategies. If you are interested in scheduling an event, please submit the inquiry form below to our amazing speaking team. We look forward to your request! Below are Sangbreeta’s most requested keynotes. She also prepares customized keynotes based on the specific needs of the event. How will you transform your presence in the sea of people who have, want and do the same thing as you? How will you future-proof your identity? How will you be remembered? Whether an individual or an organization, these questions are essential to your presence, your relevance in the world. 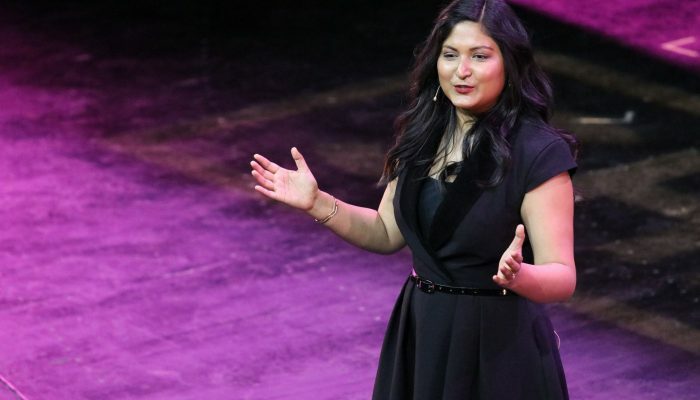 The speech that won Sangbreeta the TEDx award, this talk addresses the core of how you can define your identity, transform your presence, and how that will impact your connection with your dream client and customers. Interested to know more? Contact Sangbreeta now. Brand storytelling is so much more than a bullet list of skills. It is the core of your identity, your values and your vision. When it comes to transforming your brand story, the only rule is- there are no rules. How is your story connecting with your clients and customers? This keynote will trigger you to see your vision in a whole new perspective and transform it into a winning brand story that defines your identity and gets you your dream clients. Are you aware of the power of your customer connection ? In this talk, Sangbreeta will show how a small transformation in the way you project your vision translates to a massive transformation in the way your target audience responds to it. What is the impact that you’re leaving behind on your clients and customers? How is that benefiting your own presence in addition to that of your organization? Whether an individual or an organization, you are capable of astounding customer connection. How are you transforming your customer connection today? How will you establish your presence to lead, be heard, be remembered? How will you give sensitive feedback to teams, clients & customers in a way that motivates them to improve? How will you create a presence that represents respect, power and encouragement? With outstanding positive response from global corporate clients that rated her talk 4.9/5, Sangbreeta will address the core ‘HOW’ for leaders to create their unmissable, unforgettable leadership presence. A speech highlighting the power of extraordinary transformation within every individual, this speech is based on Sangbreeta’s own experiences of struggles, fears, failures and how they taught her priceless lessons of creating an unforgettable legacy. Dosed with emotion, humour and a strong vision, the keynote will energize and uplift your audience, leaving them with a heartfelt take-away message.